Nine years ago, Mary Farel was working with kids at the Center for Creative Education in Kingston when she saw a need. In the mixed gender classes, she noticed that the tween girls were self-selecting a back seat to the boys. She wanted to set up a space space where they could explore without distraction. “When girls are with girls, it’s a different story,” Farel says. Providing both types of learning opportunities is important, she feels. “It creates balance.” So after searching online, she found Girls Inc., a national program with the mission to inspire all girls to be strong, smart, and bold. With affiliates all over the country, the closest ones to the mid-Hudson Valley are Westchester and Albany. “I was interested in getting a program going in Ulster County,” Farel explains. So she connected with the YWCA’s Andrea Park, and Girls Inc. of Ulster and Dutchess County came to be a program of the YWCA Ulster County. 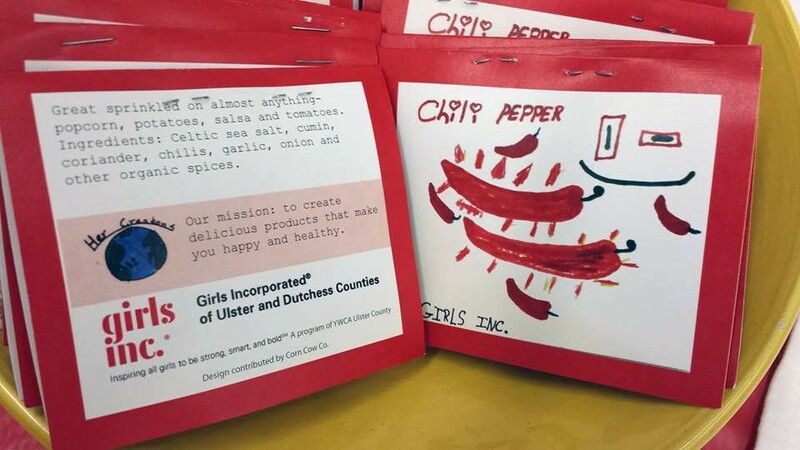 Since then, Girls Inc. of Ulster and Dutchess County has run after school, summer, homeschool, and school-based programs throughout the counties at the YWCA in Kingston, Kingston City Schools, the Center for Creative Education, among others. There are three local programs, which Mary created: The ZINE Project (where girls create a self-published magazine), Girls for Real Food (a leadership program around food activism and nutrition), and Reel Girls (where girls create a documentary movie). The national org offers eight research-based programs that all affiliates can implement. This year, as part of the Girls Inc. economic literacy curriculum, Farel has been running a weekly entrepreneurship program at George Washington Elementary in Kingston. Having completed the first semester and an 8-week activity-based series led by Mindy Kole, Business Faculty at SUNY Ulster, the fourth grade girls in the program have learned what it takes to be an entrepreneur. They understand marketing strategies, customer service, how to gauge if a business is viable within a community, and basic economic principles like cost analysis and revenue. With a variety of programs that tap into girls’ potential, imagination, and sense of leadership and responsibility, Farel, through Girls Inc., is poised to bring more programming to schools, groups, youth centers, and other facilities in the area. Get in touch with her at Girls Inc. of Ulster and Dutchess Counties, 845-338-6844 Ext. 7, mary@girlsinculsterdutchess.org. Learn more and see examples of girls’ work at their website.